TRAUMATIC: Tim and Jody Taylor outside the burnt shop. JODY Taylor isn't the type of person who asks for help. Despite having 10 days to move out of her Fry St home and find a new place, the mum of two still doesn't ask for any help. All she wants is for her children to live in comfort and safety. A fire destroyed the adjoining shop on Monday night and smoke filled her home. Yesterday she tried to fight back the tears while packing her belongings as the red and yellow "Hot Zone - Contaminated Area" tape wrapped around the house flapped in the wind. But you don't go through this kind of trauma in the Clarence Valley without someone helping and property owner Ursula Tunks has been frantically rallying support via social networking. Ms Taylor said she had been overwhelmed with the response. "We're so grateful for people's kindness. But I just want to find my new home and get my kids settled," she said. 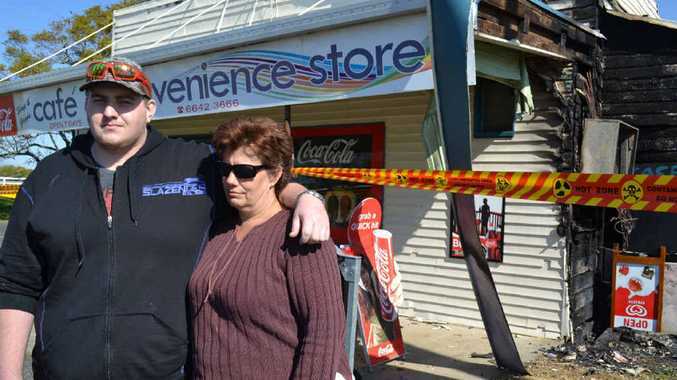 It wasn't just Ms Taylor's life that was turned upside down when late Monday a wheelie bin fire, which police are treating as deliberately lit, took out the fuse box and spread into the building of the old Cansdell's Corner Store. Ms Tunks, who is currently in Brisbane, had switched off her phone on Monday night to try to get some time out, having just lost her father. When she switched it back on the calls started to arrive to say the shop she'd bought to run with her dad had been ruined. "Both the leases have been terminated and I still have to pay the mortgage until the insurance is sorted, as well as $5000 excess," she said. "But so many people phone and text to ask what they can do to help." The fire exposed asbestos in the building, the power is still out and Ms Tunks will have to wait and see what the bank decides to do with the insurance assessor's report. Ms Taylor said she was woken on Monday night by her eldest son, Tim, who rushed the family out of the property. "There are people worse off than us, though," Ms Taylor said. Last week The Daily Examiner reported how the Singhs were now selling curry from the old Cansdell's Corner Store, where their daughter Raina stood proudly out front of the now-destroyed business. This fire was one of six fires this week that police are treating as suspicious. Contact Grafton Police on 6642 0222.